Find answers to common questions about records in HubSpot. Can I have multiple owners for one record? Why do records seem to disappear from the CRM? Why can't I find a record when I search from the dashboard? What is the maximum number of engagements in a record? Why are the Last contacted and Last activity date properties not updating? Can I select which properties to appear next to the photo in a record? What is the default lifecycle stage for newly created contacts in HubSpot? How do I set a contact's lifecycle stage backwards? Will images in emails sent from the CRM appear on the contact's timeline? Can I send an email to a list of contacts using the CRM? Why does a contact record have no page views? Why is my contact created via Analytics? Can I use a custom email field in a form to create contacts? Why are there email activities in the timeline prior to the contact's Create date? What happens when a deal's stage changes to Closed Won or Closed Lost? How can I change the deal stage from the deal record? At this time, each record can only have one owner in the default owner property. You can, however, create custom properties with the property type HubSpot user. Properties of this type will automatically pull users in your account as options. Your current view includes filters. Records that do not meet these filters will not be shown. Ensure all filters are cleared to view all records. Your user permissions restrict you to viewing only records that you own or records that your team owns. If you'd like to view all records, contact your administrator for the appropriate permissions. The search functionality in the dashboard can take up to 30 minutes to index records. Hence, newly created records may not always appear in the search results until later. The maximum number of engagements is 10,000 per record. Engagements are tasks, calls, notes, emails, and meetings that get added to the record. Any further engagements will result in an error and will not be added to the record. Learn more about HubSpot's service limits. By default, the properties next to the photo in a contact record is the contact's First name, Last Name, Job title and Associated company. You cannot select which properties to display in this area. However, you can customize the properties that appear in the About section in a record. They were added manually in your HubSpot account from the contacts dashboard. They converted on a form or lead flow, unless the form or lead flow specifies otherwise by including the Lifecycle stage property as a field. 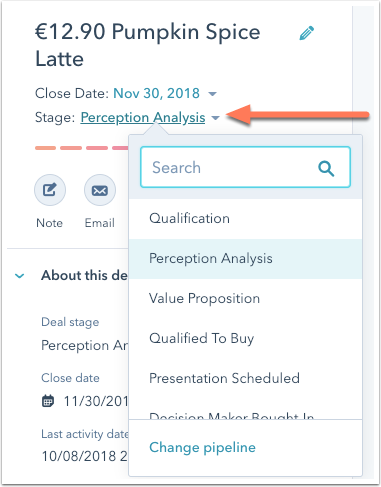 They were synced from Salesforce, unless automatic lifecycle stage transitions or company lifecycle stages sync are enabled in your HubSpot account. They were created through contact profiles in Gmail or Outlook. They converted on a default HubSpot blog subscription form. They were imported into HubSpot, unless specified otherwise in the import file. They were created through conversations. You can set a lifecycle stage backwards manually, or in a workflow by clearing the Lifecycle stage property prior to setting the new value. When an email containing images is sent from the CRM, the image should appear in the email activity in the contact's timeline. Click Expand on the email containing the image to see the full image. At this time, you cannot send emails to lists of contacts in the CRM. This is a HubSpot Marketing feature only. You can, however, send emails in the CRM to individual contacts. If you have a HubSpot Marketing Basic, Professional, or Enterprise account, learn how to send marketing emails to your lists. The HubSpot tracking code is firing on the page. This drops a cookie on the visitor’s browser. The contact has filled out a form with cookie tracking enabled. The contact has received a marketing email with identity tracking and visited your site by clicking a link in that email. If these requirements are not met, no page view will be recorded. While HubSpot can track if a contact has clicked a link in your sales email, this click does not associate the visitor's cookie to his contact record and hence, any page views will not be tracked. When a contact's property history shows Analytics as the change source, it usually indicates the contact was created through a non-HubSpot form on a non-HubSpot hosted page. Learn more about the various change sources that can be found in a contact property's history. By default, HubSpot only creates or updates a contact based on the default Email field, and will not create a contact when they fill out a custom email field separate from the default Email field. If you allow submissions to create a contact without an email address, these contacts will be created but it is recommended to use the default Email field as the field is referenced by other tools in HubSpot, such as workflows and marketing emails. These tools will not work with a custom email field. A contact was previously sent emails. The record was deleted from your contact database and then was re-created. A contact record originally had one email address and that email address was changed. A new contact record was then created with that original email address of the first contact. Any email activities tied to the original email address on the first contact record will now appear on the new contact record. When the deal stage is changed to Closed Won, the lifecycle stage of any associated contacts and companies will change to Customer. When the deal stage is changed to Closed Lost, the lifecycle stage of any associated contacts and companies will remain as Opportunity. If the contact or company has already been associated with a closed won deal, any future deals that are closed lost will not change the lifecycle stage from Customer to Opportunity. In your HubSpot account, navigate to Sales > Deals. Click the name of a deal. In the left panel, click the Stage dropdown menu and select a new deal stage. You can also edit the deal stage property in the About this deal section. Learn more about editing properties.